Overview (No Spoilers): The Country of Ice Cream Star was a wonderfully crafted, ingenious read, which wholeheartedly earns its perfect score based on the truly original and creative narrative. The world created by Newman, lies approximately 100 years in the future after a deadly disease, ‘posies’ eliminates all Caucasians and remaining population post the age of 18. The narrative follows 15 year old Ice Cream Star, who resides in the woods of Massa (Massachusetts) among a rustic tribe of children, called Sengals. Their neighboring tribes, the Army and Lowell, all have varying degrees of hostility, and technologies, which initially seem like a big deal in their all encompassing world. However, the emergence of a Roo (Russian) slowly starts the domino effect, which will forever unite and alter the lives of Ice Cream Star and residents of Massa woods, as their world exponentially expands. The narrative is boldly, and eloquently written in a shortened dialect, which elevates this novel from one that easily could have slipped into young adult. Overall, while I will be talking, and reflecting upon this novel for the immediate future I can see this work of art having a select audience that would truly appreciate its narrative. Pasha. Pasha. Pasha. Even though I had a deep down inkling of the doom and helplessness of the children of the ‘Nighted States’ warring against the Roos, I had trust in Pasha that there was hope in uniting. Pasha not only duped Ice, but the reader into a false confidence in a war of children against professionally trained mercenaries. Newman cleverly hid the foundation of this betrayal under layer after layer of trust and rumors until the final conversation between Pasha and Ice, where the realization of Pasha’s true allegiance slowly, and simultaneously dawns on Ice and the reader. Pasha’s true allegiance is a muddled mix between saving Ice and perhaps the Russians. 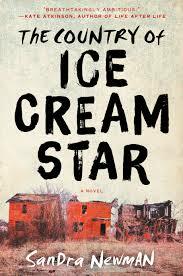 Ice Cream Star is a very different hero from other comparable literary women characters, e.g., Katniss, Tris, Cia, Mustang, due to her forced maturity. The aforementioned heroines were, for the most part, sheltered and expected a long life, however were forced to ‘grow up’ due to some resulting event in their life. However, death was inescapable for Ice at the tender age of 18, and there were no adults to shelter her, therefore she was forced into mature, adult behavior from birth. I loved the twist of Ice becoming Maria. The reader initially was engrossed in the petty squabbling of the Massa Wood’s tribes, however, as the world began to expand for Ice, it simultaneously grew for the reader as we began to get rumors of the fate of Europe, Russia, Africa, New York and Washington. New York is home to a warped catholic cult with their main language being Spanish or ‘Panglish.’ I was cursing my limited Spanish background during Ice’s time in New York due to the original dialect that the book is narrated in I’m sure I likely missed significant meanings behind words with Spanish backgrounds, therefore not appreciating some of the work as intended. What will Ice find in Europe? Will she take the Cure? Will Mamadou take the cure himself, find Ice’s Sengals or El Mayor, and come find Ice? What about other cities in the ‘Nited States’? Are there other massive cities that are surviving or warring on their own, e.g., Detroit, Chicago, LA?